• We enter all data into our advanced computerized system upon receipt. • Calling insurance companies on all outstanding claims. • Re-filing claims when necessary with proof of timely filing. • Filing appeals as necessary until claim is paid. • Researching and communcating with insurance companies to resolve outstanding issues. • Taking credit card payments over the phone if your office is equipped. • Provide each patient with monthly statement of all activity on their individual account–including the date claims were filed and payments posted to their account. • Provide several monthly reports designed to keep you informed of all your billing and collection activity. WHAT CAN EXCEL MEDICAL BILLING DO FOR YOU? You have a practice to run, not a billing operation. 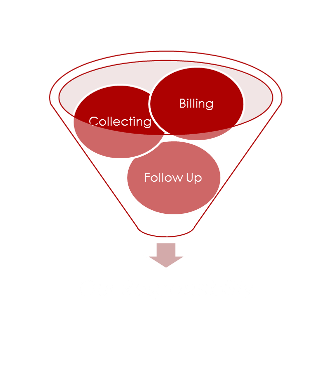 Excel Medical Billing, Inc. guarantees service of the highest quality. Contracting our expertise not only saves you money, time, and increases your cash flow, it also proves to be an asset to your practice. The billing and collecting of your money is the integral facet of your practice that determines your prosperity. If you trust professional attorneys to handle your legal affairs and professional accountants to handle your financial matters, why not let a professional accounts management team handle the billing and collecting of YOUR MONEY?! As a healthcare provider, your future relies on the prosperity of your practice. Providing quality medical care and service for your patients is a full-time commitment that will ensure the success of your practice. Likewise, superior accounts receivable management, which includes all aspects of the billing and collecting of your business services is the key to remaining competitive and responding to the ever-changing regulations facing today’s healthcare industry. By collecting receivables faster, you can manage your money so that it works for you. Whether investing financially, updating your practice with state-of-the-art equipment, or increasing your patient load, the results equal increased income. Eliminate expenses associated with on-site billing personnel - including payroll, taxes, annual leave, holiday pay, and sick leave. In addition, hours spent researching and following up on invoices, insurance payments and patient invoices are gone. Your staff can now focus on your patients. Scheduling appointments, taking training that enhances your practice, and building rapport with patients. They no longer need to act as bill collectors and fight with insurance companies. Excel Medical Billing takes complete ownership of filing, re-filing, following up and understanding the issues inherent in medical billing. Delays can occur over the simplest of matters; denials and rejections can happen due to technical mishaps or simple human error. Our job is to take on that headache. In today’s healthcare environment, the bottom line on insurance claim processing is maximum reimbursement. Simply put, the faster your claims are submitted and followed up on, the faster you get your money - and the faster your money can earn interest. Cash flow is a concern of all businesses in every industry. Excel Medical Billing gets more payments in your hands at a quicker pace. Getting funds in a more timely manner allows your practice to stop accessing financial lines and loans to meet your obligations. A healthy revenue stream equals success to any company. Onsite medical billing personnel can quickly suffer burn-out trying to maintain patient relationships and deal with past due balances, ever –changing insurance processes, and constant follow-up on invoices. Contact us in Ashton, Maryland, to learn more about our medical billing services and patient payment plans.